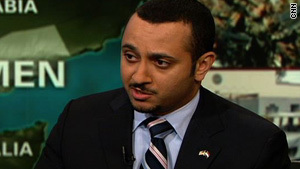 Spokesman for Yemen's Embassy to the United States acknowledges Yemen's problems with local al Qaeda group. Washington (CNN) -- Authorities in Yemen questioned people at a mosque and a school in the capital of Sanaa because the facilities were attended by attempted bombing suspect Umar Farouk AbdulMutallab, the spokesman for Yemen's Embassy to the United States said Tuesday. Mohammed al-Basha told CNN's "The Situation Room" that conversations with AbdulMutallab's former acquaintances have not yet turned up links to the local al Qaeda group, which has claimed responsibility for AbdulMutallab's attempt to bring down a Northwest Airlines flight on Christmas Day. "According to the questionings carried on today by his classmates and administrative officials of the school, [Umar] was a friendly person and did not ring any alarm bells," he said. "We knew he attended school in Yemen, and one of the mosques he was visiting in Sanaa we've been surveilling and questioning some of the people there to see whether he has links or not," he said. Al-Basha also said a claim by al Qaeda in the Arabian Peninsula that the attempt was in retaliation for airstrikes against them was "most likely" propaganda, but left open the possibility links could be found later. "I think the al Qaeda statement that came out recently saying that this is an attack in retaliation for what happened the 17th and 24th of December is unfounded, because we know that he bought the ticket a few days before that, so there's no link for the time being," al-Basha said. AbdulMutallab bought his ticket to travel from Lagos, Nigeria, to Detroit, Michigan, via Amsterdam the day before the first attack, according to Nigerian officials. Al Qaeda in the Arabian Peninsula issued an Internet statement claiming responsibility for AbdulMuttalab's failed attempt to bring down Northwest Airlines Flight 253, calling it retaliation for what it said were U.S. airstrikes on Yemeni soil. Al-Basha said airstrikes against AQAP on December 17 and December 24 were launched entirely by the Yemeni government, but acknowledged that the United States has provided the country with some assistance since the September 11, 2001, terror attacks. "The United States has been supporting Yemen since 9/11, training our forces," he said. "We have a strong intelligence cooperation, but again the last operations and all the operations this year were carried out by Yemeni forces." U.S. officials privately acknowledge they have provided secret intelligence on several al Qaeda in the Arabian Peninsula targets to Yemen's government, but won't say whether U.S. aircraft or drones took part in the strikes. Al Basha rejected suggestions that Yemen has not been strong enough in its fight against al Qaeda in the Arabian Peninsula, but noted the nation has "a serious problem." "We've been addressing this problem way before it became a global issue," he said. "Since 1992, we've been fighting. I call it the long war. Al Qaeda, we've been conducting strikes against them since that day."